Boxing Match or Baseball Game? The Astros were looking for their first win of the year today against the Phillies. In the 3rd inning, it looked as though they may just get that win. Jamie Moyer made it to 2 outs in the 3rd before all hell broke loose. He took a 4-0 lead and turned it into a 4-5 deficit in the blink of an eye. For a few minutes, many wondered if they were watching a baseball game or a boxing match, as Moyer took blow upon blow from the Astros bats. With 2 outs in the inning, the right and left hooks began, starting first with the Astros pitcher who whacked a double to get the rally started. Here is the remainder of the beating, which even included a single from former teammate, Pedro Feliz: 2-run homer, a walk on 4 pitches, 2-run homer (yes, again), 4 singles in a row to score the 5th run of the inning. It was a total knockout. Or, maybe not…the Phillies rallied back in the 7th inning and took the lead again on a Ryan Howard 2-run homer. Howard also tripled and walked with the bases loaded for an RBI earlier in the game. Shane Victorino, who has been very unlucky of late, finally got in on the action with an RBI single in the 7th. In the 9th, Victorino hit a 2-run homer to give the Phillies a 9-5 lead. And then he breathed a sigh of relief…whew! As for the bullpen, Chad Durbin mowed down the Astros in the 7th inning. Danys Baez followed suit in the 8th and then Ryan Madson came in for the 9th with 4 runs to play with. He gave back one run but still escaped with a 9-6 win. 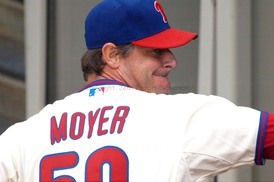 So the question now remains, how effective will Moyer be in future starts? The one big inning nearly killed him, but the Phils bats bailed him out. But no team can be expected to score 9 runs every game. Well, it was only his first start, so we will have to wait and see how his next start goes. The Phillies will finish the series with the Astros Sunday at 2:05pm. It will be a battle of the Roy’s; Halladay vs. Oswalt. The Astros are still looking for their first win, so do not expect them to just lie down and give up. It should be a good game….Go Phillies! The Phillies found a back-up catcher today when they signed Brian Schneider to a $2.75 million, 2 year deal. Schneider spent the last 2 years with the Mets and the previous 8 seasons with the Nationals/Expos. The best news here is that Schneider was notorious for being a Phillie killer; pitching to him has been a 10 year nightmare. Overall, Schneider is a .251 hitter and should fit nicely into the back-up spot vacated by Paul Bako and Chris Coste before that. As for the other holes in the line-up, like third base, no word yet except that midnight tonight is the deadline for all teams to offer salary arbitration to their free agents. The Phillies are likely to offer arbitration to Chan Ho Park as they have stated they want him back next year. Park may decline and decide to look around for a starting pitching spot as several teams have seemed interested in him. If he accepts, he will be with the Phillies for 2010 and probably get a raise. As for the other free agents, Bako and Eric Bruntlett are out of the picture with their replacements already signed in Brian Schneider and Juan Castro. Brett Myers has already been shown the door, as has Jack Taschner. Pedro Feliz, Pedro Martinez, Matt Stairs and Miguel Cairo are also unlikely, although Stairs and Cairo may be offered minor league deals. So, have we all looked at our season ticket invoices yet? This is not a huge shock, but Phillies ticket prices went up again this year by $2- $4 per ticket. Not only that, but some season ticket holders received worse seat assignments. Someone I know got bumped backwards 2 rows in the same section. So, we are now paying more for less? While 2 rows is not earth shattering, traditionally, season ticket holders have been rewarded for their loyalty with better seats from year to year, not punished. So yes, the World Series win in 2008 plus the return trip in 2009 do affect the prices, unfortunately. But that does not make it any easier to swallow. The money does not go towards improving the team or free agency; it is just more in the pockets of the owners. And with the team winning now, they do it simply because they can. So, did anyone else get there ticket invoice and wonder what happened? Did you get the same seats or did you get bumped back? What do you think about the prices? Let me know in the comment section below. 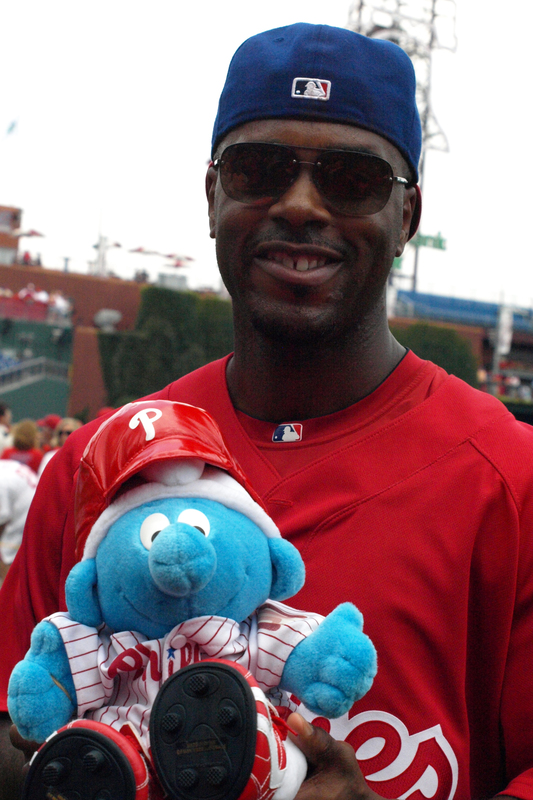 If all that glitters is gold, Phillies Jimmy Rollins and Shane Victorino have enough bling to go around. Both players were awarded the Rawlings Gold Glove Award in their respective positions yesterday. 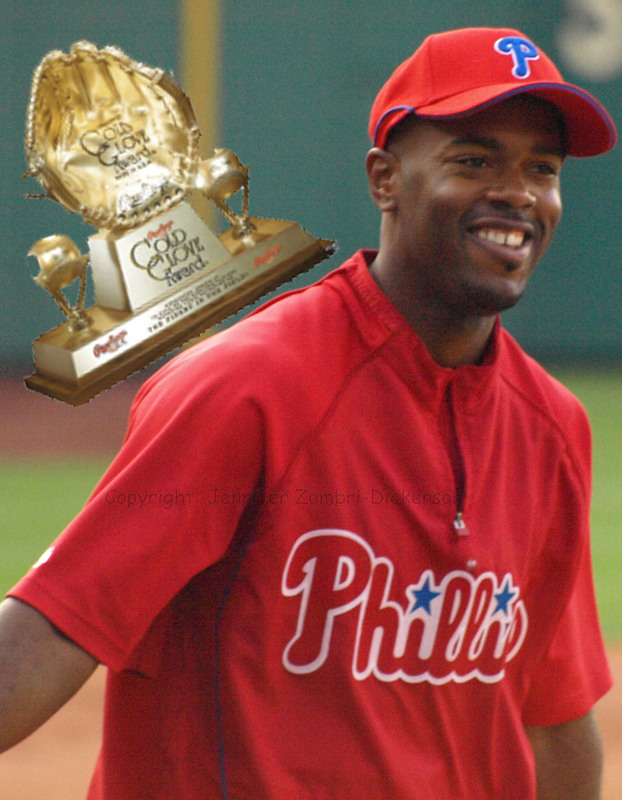 For the shortstop Rollins, it is his third Gold Glove in a row; for centerfielder Victorino, this makes two in a row. 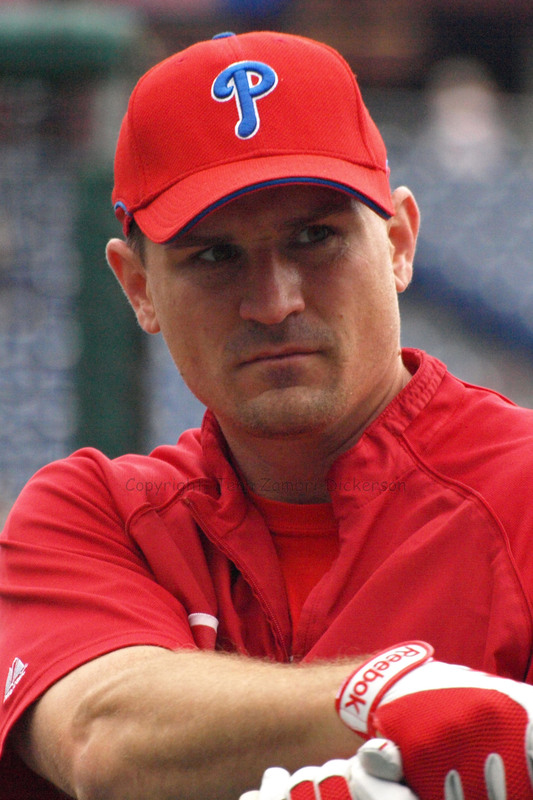 Rollins had only 6 errors all year, which was the best among all qualifying players. Victorino had a .997 fielding percentage, 2nd best in the NL among outfielders, and 5 assists. On the injury front, Brad Lidge had surgery yesterday to repair his right flexor tendon as well as remove loose bodies from his elbow. It was not known before the surgery if the tendon was damaged, but it appears Lidge was worse off than anyone let on. That fact has caused quite a stir among fans who are very disappointed about the whole situation. Tell me again why Lidge was pitching with serious injuries, especially in the World Series? But everyone must look forward now and it appears that Lidge will not be ready for the start of Spring Training. As a result, the Phillies have been reportedly looking for another / back-up closer. They need bullpen help anyway, so this is no surprise. 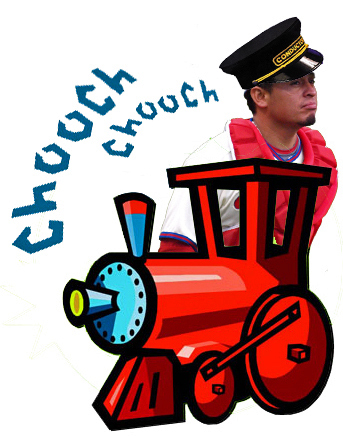 As for the Roy Halladay / Cole Hamels rumors, GM Ruben Amaro Jr. insists this will not happen. Again, not much of a surprise as such a trade was a long shot at best. In fact, the Jays demands are still very high, so it is possible that Halladay may not go anywhere. Thank you everyone for the comments yesterday on this topic :O) And to clarify, I have not given up on Hamels. Odds are that he will rebound and have a better year. 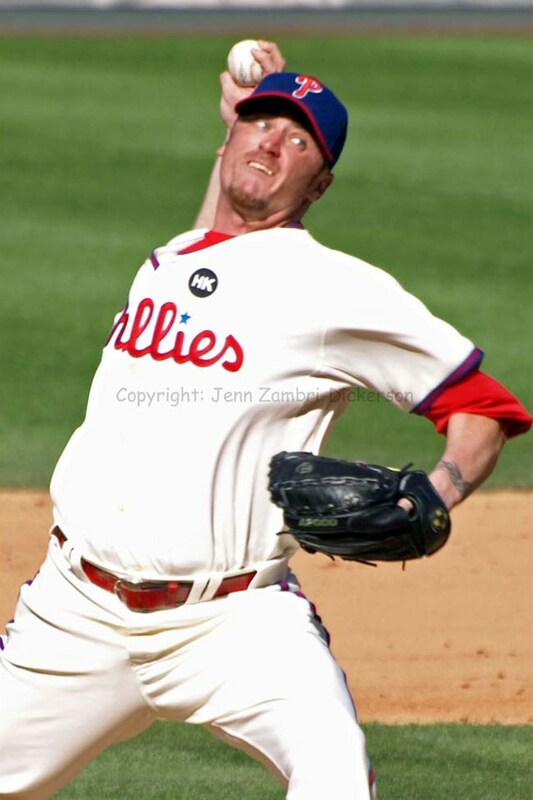 However, the thought of a Cliff Lee – Roy Halladay combo, two proven veterans, is an exciting thought. Think about it this way: The Phillies window to win another championship is closing. We will probably have Lee only for 1 more year as he is going to command Yankees-type money, which the Phillies historically are unwilling to pay. They may strike a deal with him, but do not hold your breath. The core of the team is intact for a while, but the pitching overall has been shaky down the stretch. If the Phillies can get a quality third baseman, improve the pen and add or develop a solid starter, they could be unstoppable in 2010. In my humble opinion, they need to toss everything, including the kitchen sink, at this 2010 team. But that is just a dream and the Phillies will need to do the best with what they have. Hopefully, that will include a few more quality pitchers. Will There Be An Early Christmas Halladay For The Phillies? Oh yes, here we go again… It is only mid-November and the Roy Halladay rumor mill is already in full swing. While the Phillies were unable to strike a deal with the Blue Jays in July for the star pitcher and instead wound up with Cliff Lee (and we are all ok with that, of course), the Jays may still be looking for a chance to get Halladay off their payroll. If the Phillies can manage a deal for Halladay, odds are they will have to pay much less for him than they would have in July since now he is only good for one potential post-season instead of two. But the Jays are probably still interested in the Phillies top prospect, Kyle Drabek, whom the Phillies are unlikely to part with. In an interesting twist however, it has also been rumored that the Jays might be willing to take Cole Hamels. Can I get a Hallelujah and an Amen to that possibility?!! 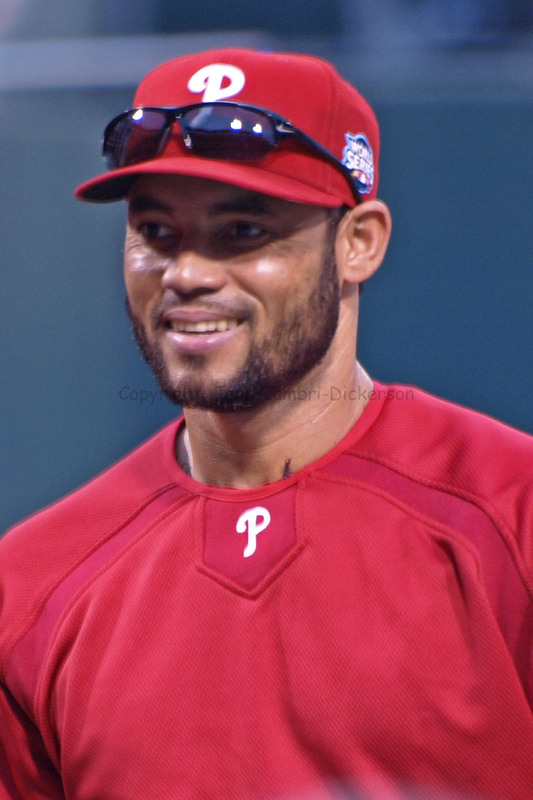 Besides upgrading the pitching staff, it appears the Phillies now need a third baseman as Pedro Feliz did not have his option picked up. The Phillies can still sign him as agree agent if they come to an agreement, but it looks more likely that the Phils will look elsewhere. Feliz had a decent season, but I think he really screwed himself in the playoffs where he hit only .167, made unproductive outs in crucial situations and hit into double plays that killed rallies. Plus, he is 34 years old, which does not help his case. The top prospects for third base right now are Chone Figgins, Adrian Beltre, Mark DeRosa and former Phillie, Placido Polanco. Figgins would be the best choice, although fans loved Polanco when he was here and many were upset when Chase Utley took his job. Hind sight, as they say, is 20/20. Back in 2005 when Polanco went to the Tigers, many Phillies fans felt he should have been moved to 3rd base to keep him on the team, myself included. As it turns out, had the Phillies done so, Polanco would likely still be with us. Up to that point, he had moved back and forth from 2nd to 3rd base for years. But after going to the Tigers, it was 2nd base all the way. The question then with Polanco is, could he transition back to 3rd after more than 4 years steady at 2nd? That may be too big a question for the Phillies to consider taking him. So, third base is wide open right now and several other Phillies have filed for free agency; Chan Ho Park, Matt Stairs, Paul Bako, Pedro Martinez and Miguel Cairo. The Phillies will not likely sign Martinez again, as he will command too hefty a salary and they need a more consistent arm. Park is a possibility, Cairo and Bako will probably not be back and Stairs I am not too sure about. My feeling was that he might retire, but since he has filed, I now do not know what is on his mind. But this leaves the Phillies with the need for a back-up catcher, a right handed bat off the bench and a variety of pitching needs. As for our walking wounded, both Scott Eyre and Raul Ibanez had successful surgeries yesterday and are expected to make recoveries before Spring Training. Eyre may or may not decide to retire so his future is uncertain. 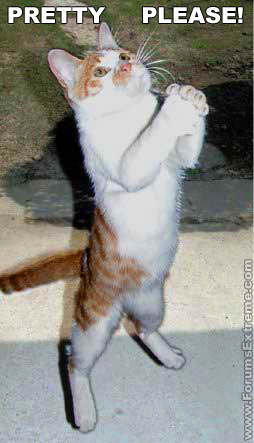 Ibanez, we hope, will be back to 2009 first-half form. Brad Lidge will have surgery tomorrow. What exactly is wrong with him will be an interesting revelation. We should have more information in the days to come.